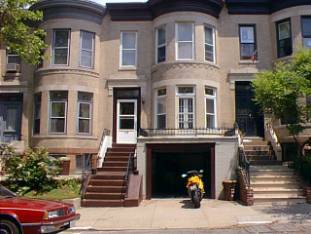 In January 1999, I said goodbye to my downtown loft and moved into an old row house. While I got it at a terrific price, it took almost a year to close the deal. Sellers were dying, powers of attorney were dying, people were falling off roofs and my mortgage commitment was days away from expiring. It was a fitting prologue to the story. I liked the style of the house but the initial attraction was the attached garage for my bikes. Almost every house on the street, except this one, was well cared for. The neighborhood was quiet and there was a pretty park at the end of the block, not that I would have time to actually visit it over the next few years. The house had great bones but suffered from decades of neglect. I questioned whether or not I had bitten off more than I could chew. This wouldn't be a rip-and-replace for one thing. In my youth, I had worked on gut rehabs, which were essentially new construction. My prior home was a 5000 square foot factory space that I'd converted into a residential loft. I'd designed and built a couple of commercial recording studios. I had some cabinet and furniture making experience. But I wasn't really sure what to do with an old house, except what I saw on TV. My intent was to return the house to some of its former glory and not cop out with a typical sheetrock-and-clamshell moulding rehab. The original house, as I later learned from seeing my neighbors' homes, contained a trove of woodworking treasures: two pairs of oak pocket doors, a carved oak mantle seat, oak crown mouldings, hardwood gingerbread detailing, five panel oak doors, and such. Mine were long gone. The irony is that they were probably traded off to fly by night handymen in exchange for the crummy work I was about to undo. What few attractive details remained in the house lay under layers of cheap latex paint. The garage roof was rebuilt. New brick and limestone surround. New garage door and door surround. New wrought iron french doors at entryway and deck (tough to see in this shot). 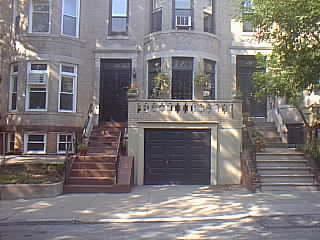 Three weeks of stripping and pressure washing the stoop to bring back the old brownstone. New mahogany garage door and surround (built in my shop). The opening was widened to seven feet to accomodate the motorcycles and my car. ("Supersize" to see the surround carving). New brick stoop and railings. 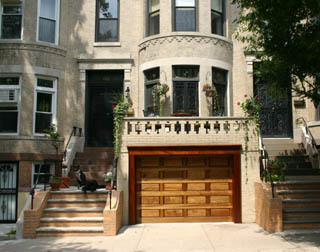 Jim Lally of Galway Bay Contracting did this excellent work, as well as my neighbor's matching stoop. No more window air conditioners. I installed Fujitsu split unit AC. New dogs! Of course, Jack and Auggie each have their own web sites. Go to the BrooklynRowHouse blog! We just purchased an old house last year. I just came across your site and I have to say I'm very impressed with your progress. We just started working on our house this summer, and I swear it's going to be ten years before the house looks like it's done. It's nice to see some "after" pictures. It reminds me that there's light at the end of the (very long) tunnel. Thanks. There are lotsa inside photo spreads in the links to the right. Just came across your blog from houseblogs.net and wanted to stop by to check it out further. Just beautiful. 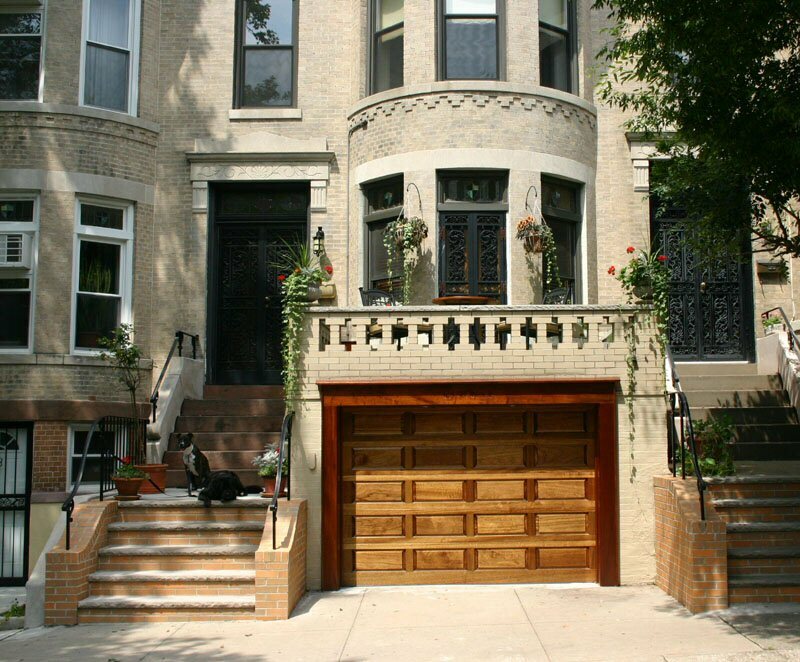 I really love the garage door - you actually constructed that yourself?! Wow! Love the new family additions as well...Jack looks like he's got a bit of Newfie in him? Same sweet face like our dog Ayla. Thanks. I found Jack at a CACC (city shelter) adoptathon in June '05 when he was five months old. Karen volunteers for CACC and called me on the road with what she thought was my perfect dog. I drove over and he was. I adopted him in (no kidding) sixty seconds. He looks like a miniature newfoundland, if you can call 95 pounds "miniature". Karen thinks he's a pet shop newfie. Great disposition, very smart. I found Auggie in the park while walking Jack in Nov '05. Someone had abandoned him there when he was 13 weeks old. He's even smarter than Jack. You can see the wheels turning in his eyes. Anyway, they became instant brothers. There's never been any trouble between them even though they're both male and relatively alpha. It's funny watching them be each other's wing man at the dog run. I came across your blog while researching historic home renovation and you had made a comment(Houseblogs.net on Dec 23 2006)regarding my parents George Barber home located in Madisonville, Kentucky. It's a beautiful home which we are going to put on the market in the near future. We are hoping to find new owners who would appreciate and restore the history of the house. You have done a beautiful job with your renovation! Please do let me know if you are aware of others who might be interested in restoring an enchanting 1895 brick George Barber home. We actually have the original floorplans. Congratulations on a wonderful project! You must be proud! Just passing by on this site, that a friend sent to me. Your project and your pets are wonderful. i know the people on your block are proud of you. What a beautiful looking house. It reminds of the Georgian townhomes built in the 1700's in my home town in England. Wow! I've always agreed with the idea that 'God is in the details' and your house proves the point. Good work! Hey! Long time no talk to! Lots of nice progress on the house. Love the dogs. Any new pics? Augie looks like he might be an Am Staff and resembles our dog (long since deceased) Lacey. They are are some smart puppers! Good to hear from you! I recently posted Stafford's Winona archive to Flickr and left a note on rec.motorcycles.harley about it. I ran across the old photos of you and Mikey and got homesick for the old VB&G days. Still driving Ducatis? Jack and Auggie are all over this blog. I was recently messing with my digital, trying to learn how to do action shots and did a test with Jack as a model that I thought was hysterical. I posted it on Old House Web, where it was probably received with the lukewarm reception that baby pictures deserve. Wow! It really looks amazing and I love the front door. The garage looks much better especially with that brown color. Good work. Your house has gone through major changes through the years, huh! And I can see that it has really improved. It's so gorgeous! The same also goes with my house. It was already beautiful when we first moved in, but as years passed by, we also did major changes like the replacement of windows and doors, and changing of the wooden stairs to metal spiral stairs, and they made a big difference.